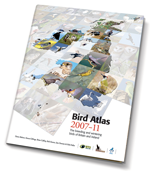 Like many bird surveys the Atlas used the Ordnance Survey National Grid as a means of identifying locations of bird records. There are various scales of resolution, but for the Atlas we worked with 10-km squares and tetrads. A 10-km square as its name suggests is a square 10 km by 10 km. A tetrad (from the Greek tetras meaning four) on the other hand is a collection of four 1-km squares arranged into a 2 km by 2 km square. There are 25 tetrads within each 10-km square and these are labelled A to Z, excluding O (to avoid confusion with zero), from bottom left (SW) to top right (NE). The figure shows this diagrammatically. A tetrad is then given its full reference as the 10-km square code followed by the tetrad letter (e.g. TF73G). 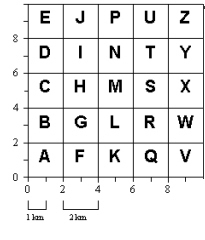 Read more detail on giving complete grid references. We strongly recommended you got an up-to-date map of the area you proposed to survey. Part of the fun of Atlas projects is poring over maps, deciding on the best route to take you past this pond, or that promising-looking wood. Ordnance Survey Landranger maps (1:50,000) or Ordnance Survey Explorer maps (1:25,000) are perfect for this purpose. In Ireland the Ordnance Survey of Ireland Discovery Series (1:50,000) maps are most useful. A transparent overlay for the Landranger maps showing a 10-km square and tetrads was available on request during the Atlas survey period. Read full details on how to read grid references.